In 1999, the BBC broadcast a trilogy of documentaries discussing leading influential philosophers of the 20th Century. 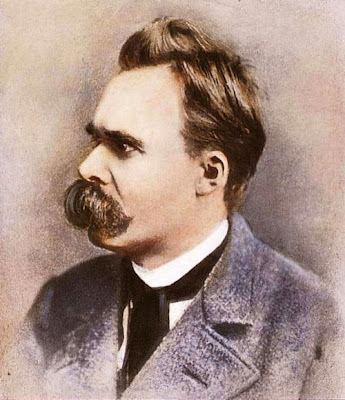 Named after Friedrich Nietzsche's Human, All Too Human, the focus fell on the European tradition of what is loosely termed Continental Philosophy, and discussed the life and work of three major thinkers of the last two hundred years. The first of the episodes guides us through Nietzsche's life and work with the help of some esteemed scholars in the field. The British writer Will Self makes a brief appearance, as does the wonderful Reg Hollingdale (translator of Nietzsche, Schopenhauer, and other German philosophers). And while much of the documentary comprises all-too-brief summaries and the occasional oversimplification, it's still a fun and accessible guide to the philosopher and some of his major ideas. Much of the imagery in the documentary reinforces the public perception of Nietzsche as a kind of dark romantic, conquering the mountains of some lost Caspar David Friedrich landscape; and if that's the kind of quality that pulled you toward Nietzsche in the first place, you won't be disappointed. On the other hand, if you're looking for a little more to hang your hat on, then the programme also attempts to make Nietzsche relevant to contemporary concerns and anxieties prevalent in twenty-first century culture. In short, it presents us with one of the first truly modern philosophers. Some really are born posthumously.